If you're new to Challengermode you might want to start reading from the top, if you're just troubleshooting some step of the process feel free to scroll through. To play team tournaments (2v2 - 5v5) you'll first need to create or join a team. 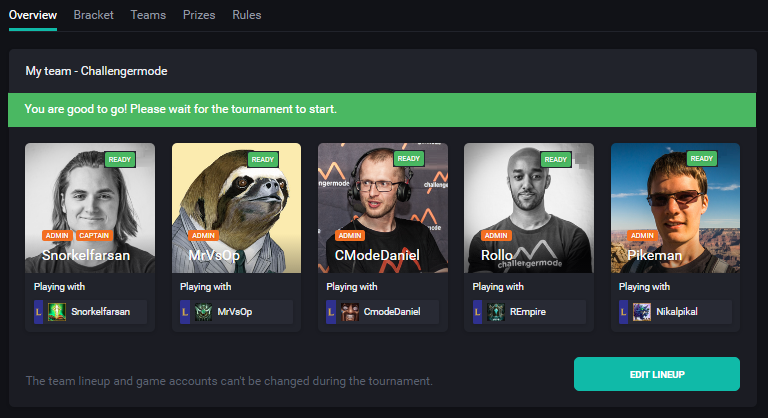 If you already have a team simply click on the Join Tournament button. 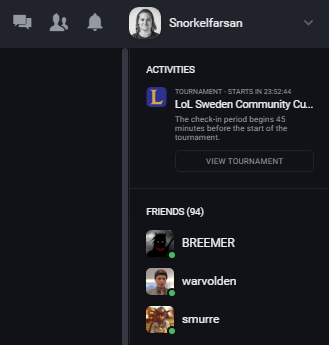 When joining 1v1 tournaments (for solo players), you just have to register and then confirm participation during the check-in period. Select the pre-made team you wish to join with. When you have added your team to the tournament, every team member drafted into the lineup will receive an invitation as a tournament activity (below). If substitutes are allowed for the tournament (e.g. 5+2 team size), you can also add 1 or more team members as substitutes during the team drafting. Before you and your team are ready to play, everyone in the team (not just the captain) must confirm their participation. This is done during the check-in period, usually 30-60 minutes before the tournament starts. This indicates that your team has checked-in and will be automatically seeded into the tournament bracket once the tournament has started. Note that the lineup cannot be changed during the tournament. But you can change players by clicking "Edit Lineup" before it has started. If substitutes are available in the tournament, you will be able to "sub out" players during the course of the tournament. Read more about substitutes here.